It’s a summary of what’s really been driving markets and is likely to continue to do so in the coming week and beyond. In particular we focus on the key things to watch this week, the durability of the current rally in stocks, other risk assets, the US dollar. In a nutshell, last week showed yet again how the entrenched technical momentum has changed how markets respond to fundamental data: buying on good news days, minimal selloffs on bad news days, followed by a buy-the-dip fueled rally as soon as there is positive news to provide and excuse. Do we trust it to continue? See below for details. Speculation on Tapering of Fed Stimulus: Justified? The Tepper Effect: Tepper’s Influence, Reasoning, And Is He Right? Investors Continued Belief That Japan’s Easing Will Work, Correct or Not? The biggest news from Monday continued to be last Thursday’s comments by San Francisco Fed President Williams expressing hope that QE can begin to be tapered this summer and finished by year’s end. He’s said this before, but his words are especially significant because he’s one of the FOMC’s doves. He also reminded us that even without QE, Fed policy would remain extraordinarily loose. That’s true, but markets are forward looking, and if that tapering comes, would be more focused on what further tightening moves might be coming than on what’s already happened. That said, given that global growth remains weak to negative in the developed world, and that actual top line revenues as well as earnings remain, not surprisingly, flat to lower, Fed and other central bank stimulus has been the primary driver of a historically unprecedented combination of record stock index highs AND weak economic and earnings growth. Will Fed Cut Back QE? Really? Neither of these scenarios is likely. If the economy’s slow recovery falters, the Fed is likely to hold steady or even increase easing measures. We do suspect there will be some kind of minor move that strikes a balance between showing ‘seriousness’ about cutting the deficit, raises hopes for more on the way (eventually) but keeps policy in easing mode. Remember that the US is not an export based economy, so the US can handle a stronger dollar without any obvious overall harm, and would arguably benefit from it. Exports contribute about 14% of overall GDP. For all the talk about how a lower dollar helps exports, in fact it’s a distinctly mixed blessing for the #1 economy, which still imports more than it exports ($1.970 trln imports vs. $1.280 exports per 2010 WTO data). Remember too that unlike other export based nations, US stimulus was not primarily about exports, but about keeping rates low to prop up the banking and housing sectors, and reap the trickle-down benefits to hiring and consumption. Also, even if Fed tightening is substantive and not just symbolic, the resulting drag could be greatly mitigated by any number of factors, particularly continued easing from other major central banks. The Bank of Japan is just warming up with its currency debasement/anti-deflation program, and the ECB is unlikely to have any options beyond not tightening or further easing. In sum, there is a reason why the bull market continues to run. The EU has avoided further crises, mostly by simply deferring future pain with more lending funded by borrowed money, and also by a heavy dose of hope that somebody really will backstop all that GIIPS bond debt being issued. The prevailing calm certainly has nothing to do with any material progress in fixing the GIIPS economies. On Tuesday, markets jumped after influential hedge funder David Tepper said he was very bullish on stocks despite their being at record highs amidst slow to negative growth, because of the following 3 reasons, which we’ll examine one by one. The global economy was improving, albeit slowly. This is true for the US, Japan, China, Germany, and some EM nations. It is not true for most of the EU, which still presents a real contagion threat. The question is whether contagion risk can be defused before it happens, that is, whether it can be deferred long enough for the EU to make enough repairs to eliminate material contagion risk. Central banks continue easing, overall (witness the rate cutting from multiple central banks in prior weeks). True, and whether that matters depends on whether you believe it will continue to prop up stocks. So far, so good. The equity risk premium is at a historical high. The equity risk premium is the expected return on a broad stock market index in excess of the long-term risk-free rate, which is often measured by a government bond yield. The higher it is, the greater the extra return from stocks over the benchmark bonds and thus more bullish it is for stocks. And it’s at a historically high level. –The reason stocks yield so much more than US government bonds is that bonds yield less than ever, and that’s due mostly to either the direct or indirect affects of one or more of the QE programs and their overseas equivalents. –Zero Interest Rate Policy (aka ZIRP) means that investors have few choices other than stocks, particularly large investors and institutions that need to deploy a lot of cash quickly. Do you? Again, so far it has worked, at least for stocks and other risk assets. QE Both Continues, And Continues To Work: Central bank stimulus remains in place (low bond yields and piles of cash seeking a home) continues to prop up risk asset prices despite weak global economic and earnings growth. We deal with both questions below. Yes, I agree, Tepper’s a zillionaire Cliff, and you’re not. Fair enough, but just evaluate the following ideas based on their merits, not my personal net worth. How Reliable Is the Equity Risk Premium Today? We find that the equity risk premium is high mainly due to exceptionally low Treasury yields at all foreseeable horizons. In contrast, the current level of dividends is roughly at its historical average and future dividends are expected to grow only modestly above average in the coming years. In other words, stocks aren’t cheap because of higher dividends but rather because of lower Treasury yields. If so, then even though the equity risk premium is due to Fed-manufactured artificially low rates, as long as those continue, the equity risk premium may be valid. Yield seekers still could continue pouring into stocks for lack of better alternatives. So again, the big question remains, will the low yields continue? The consensus appears to be that even if some kind of tapering begins, Fed policy is likely to continue to be ultra-accommodative. See here for one good argument for that. Meanwhile, the overall PE ratio for the S&P 500 is about 15 times earnings per on estimated 2013 earnings. That’s about average, but far from historical lows which are around 9. However both the IMF and BIS both expressed doubts about potency of further easing. A new IMF study says central bank bond buying risks succumbing to a basic economic principle: the law of diminishing returns. Extraordinary policy maneuvers were able to restore stability to financial markets in the wake of the crisis and may still “be appropriate in some circumstances,” but there “may be diminishing returns” in the future. The general manager of the BIS expressed a similar opinion in a speech Thursday, saying that the policy mix should be refocused “to rely more on repair and reform” in order to avoid “overburdening monetary policy. See here for details, covered in a separate article. The 10 year Japanese Government Bond yield rose to 0.92%, its highest since last April. Rising bond rates are a predictable outcome of Japan’s debasing of the Yen. After all, if you’re going to get repaid in Yen that are likely to be worth much less, you’d want a higher rate to compensate for what you lose in principle repayment. However given that debt service (never mind eventual principal repayment) alone accounts for about 25% of Japan’s budget, the consequences of failing to keep bond yields low cannot be overstated. A mere rise to 1.84% (still below the rate for the US 10 year note, currently at 1.95%) would put debt service at about 50% of its budget, which is already 46.3% financed by new annual bond issuance. The debate over how great a risk Japan is taking is complex and has some rather bright people on both sides of it, like Kyle Bass (betting on a Japan collapse) and Ed Harrison who takes the other side. So far Harrison’s been right, as Japanese bond yields have been lower or steady overall in recent months despite the crashing JPY. A full discussion would be beyond the scope of this article. See here for links to Harrison’s more optimistic view, and here for Bass’s bleaker outlook. For now however, markets are enjoying Japan’s radical easing as it remains the driving force behind the rally in Japanese stocks. Will it work? Credit Suisse’s Henry Russell is skeptical, but per a Reuters report last Friday, he still believes it should be enough to prop up Japanese assets for the next 12-24 months. The most compelling reason why we believe this rally is not over comes from the technical picture. From February until mid-April the technical picture of global markets could be summarized as a standoff between entrenched long term upward momentum and decade old resistance, against a background of weak global growth that suggested the resistance would win out. The big question was whether coordinated central bank stimulus could pump asset prices and keep investors bidding up risk assets enough to overcome the otherwise weak global economic fundamentals that don’t justify this rally. It did – resistance was decisively broken in mid-April and most global stock indexes (as represented by the S&P 500 below) haven’t looked back. In other words, the bellwether S&P 500 and other major global indexes have not only decisively broken decade old resistance, they continue to display strong momentum. In other words, we don’t argue with a strong trend, ever, until it gives us evidence to doubt it. It hasn’t thus far. The danger here is that the trend is so entrenched and strong that many might incur substantial losses before a pullback does enough technical damage for us declare the uptrend officially over. That’s the question you really want answered. Here it is. The key part is in italics below. While fundamentals do ultimately drive technical trends we see on the charts, divining which fundamentals matter and when they’ll kick in is often, ahem, difficult. That’s why, when in doubt, we don’t fight price action, especially when it comes in the form of such strong trends and momentum. We may choose not to add longs, and risk nothing but lost opportunity. However to avoid losing actual cash, at minimum we don’t try to short a market showing this much strength until we get clear signs that the trend and momentum are exhausted. The uptrend is obviously still in strong upward slope. 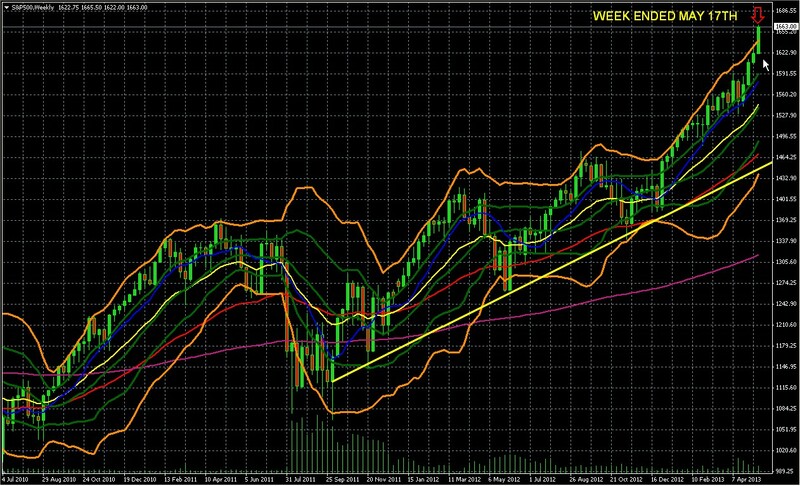 This is weekly chart, so that’s a very entrenched trend that can handle a normal 10-15% correction and remain intact. Most importantly, the index remains firmly within its upper double Bollinger band buy zone, the upper double Bollinger band zone bounded by the upper gold and dark green Bollinger bands. See here for a quick explanation of how to interpret and use them. In cases like this, when we’re at historical highs and have no clearly established support or resistance, this is our indication that there is enough upward momentum to trust the trend to continue. Some may wait for a pullback to the lower end of the zone, some won’t. As we discuss in depth in our award winning book, The Sensible Guide To Forex, double Bollinger bands are arguably your most useful indicator for deciding whether or not it’s too late to enter an established trend, and to minimize the risk of buying at the top or selling short at the bottom. This tool will help you make money, or at least avoid losing it. The Euro or Euro related assets. There is still far too much risk in the EU for our tastes, unless you’re considering a short term trade on a compelling chart. The more closely tied to the fate of the Euro a given asset, the less we like it. For example, the stock of an EZ based company that gets most of its revenues in Germany or outside of the EZ is less of concern than one with the opposite characteristics. Commodities heavily tied to Chinese demand. Anything that is in the middle or lower double Bollinger band zones. For reasons we discuss here, the USD (which has generally moved in the opposite direction of stocks in recent years) has been moving with stocks and can be considered for long positions. That means long positions in in USD ETFs or currency pairs that move up with the USD, or short positions in pairs that move opposite the USD like the EURUSD. Markets are responding to data in the way they usually do when there is a strong overall trend. News that contradicts the trend gets less reaction, news that confirms it gets attention and response. That means good news brings buying, bad news brings minimal or no response, and good news days that follow a bad news day brings a stronger buy-the-dip response. As long as whatever you’re trading stays within its upper Bollinger band buy zone, you can consider new long positions, preferably on some kind of dip. At least don’t short it. ← US Dollar Weekly Outlook: What’s Really Driving The Rally?